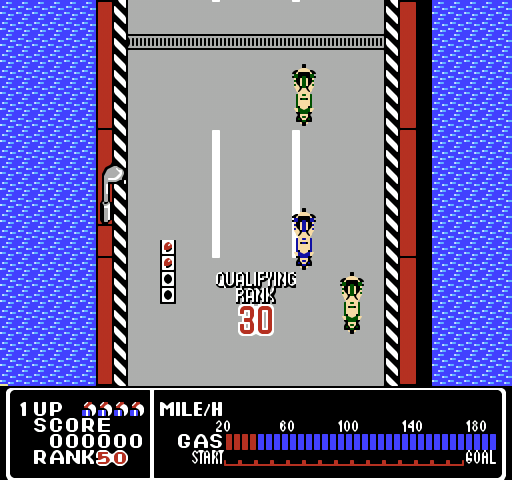 Rally Bike is a top-down racing game that was originally released in the Arcades in 1988. It consists of six courses and your objective in each is to qualify within a certain position to advance to the next heat. Useful items are dropped by helicopters that include invincibility and helper motorcycles that attach to your vehicle to take out any racers in their way. Careful management of your fuel is required (refuel spots are available at specific points) and placing in the top ten allows you to enter a shop where you can upgrade your bike with better engines and tires. One of the biggest issues is the amount of sprite flicker on screen when your rivals are biking close by; it's distracting and the main reason it's so confusing is because fellow riders briefly flash when they crash their vehicle; therefore, with only a split-second to react, it's easy to think that the sprite flicker is an eliminated enemy, leading you straight into a nasty collision! This highlights another bugbear, as when you do crash there are no checkpoints and you're dumped right back to the starting line; it can be disheartening and brutally difficult to progress. It's a shame as there are some interesting set pieces, for example in Stage 2 where you're suddenly chased by a maniac truck driver! I also like the varying scenery as you progress, such as in Stage 4 where you speed through country roads, jump over a train track and then zig-zag your way through a forest. The frame-rate is buttery smooth and a handy map at the bottom of the screen displays your journey along the stage route. The special items are a good idea, but the helper motorcycles seem to negatively affect the collision detection, especially when riding through cramped areas. Rally Bike's punishing difficulty is a real turn-off and it's clearly only present to disguise the game's otherwise short length. 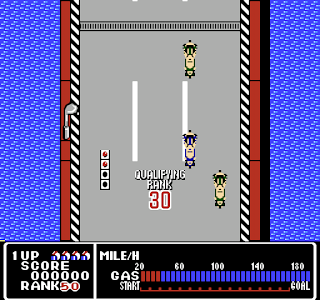 The game does have a few merits, but they're muted by various technical and balancing issues, and my advice is to stick to Zippy Race (1985, Famicom) instead as it succeeds in all areas where Rally Bike fails. Random trivia: The game was also ported to the Sharp X68000 computer in 1991.